For the second season in a row, Real Madrid sensation Luka Doncic has been chosen unanimously by Turkish Airlines EuroLeague head coaches as the winner of the competition's Rising Star Trophy. The award recognizes the best player in each EuroLeague season who was under the age of 22 on July 1 of the previous summer. There was no doubt about the identity of this season's winner after a spectacular campaign that saw Doncic not only lead the league with an average performance index rating of 21.8 per game, but also top the charts in per-minute PIR with 33.9 prorated over 40 minutes. The 19-year-old delivered in virtually every area; he ranked fourth in scoring with 16.1 points per game, ninth in defensive rebounds (4.0), 12th in assists (4.4) and 11th in steals (1.2) over 31 appearances. Doncic was chosen as the EuroLeague MVP for October and was MVP of the Round four times, matching the most this season by any player. Beyond individual exploits, Doncic embraced his leadership role in the absence of injured EuroLeague MVP Sergio Llull to play the most minutes on his team and ultimately lead Madrid back to the Final Four. Alberto Abalde of Valencia Basket was second in the voting, followed by Crvena Zvezda mts Belgrade center Mathias Lessort. Jonah Bolden of Maccabi FOX Tel Aviv and Luca Vildoza of KIROLBET Baskonia Vitoria Gasteiz tied for fourth. 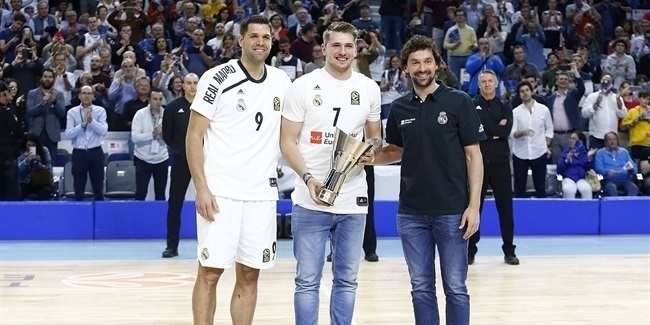 The Rising Star Trophy is one of several end-of-season honors awarded by Euroleague Basketball. Earlier in the week, Alexey Shved of Khimki Moscow Region was confirmed as the 2017-18 Turkish Airlines EuroLeague Alphonso Ford Top Scorer. The 2017-18 EuroLeague Best Defender and the All-EuroLeague honorees will be announced later this week. The identity of the 2017-18 Turkish Airlines EuroLeague MVP will be revealed at the Final Four in Belgrade. The Alexander Gomelskiy Coach of the Year Trophy and the EuroLeague Club Executive of the Year are post-season awards. Doncic was already regarded as a major talent when he arrived in Madrid from his native Slovenia at age 13. He lived up to his reputation with a series of spectacular showings at the junior level, including winning the MVP award in the 2015 Euroleague Basketball ADIDAS NEXT GENERATION TOURNAMENT, won by Madrid. He has continued to excel since stepping up to senior basketball, belying his tender years with exceptionally consistent and versatile performances. From opening night of the 2017-18 EuroLeague season – when he scored 27 points on the road against Anadolu Efes Istanbul – it was clear that Doncic was ready to deliver something special. A fortnight later, he claimed back-to-back MVP honors in the first double-round week of the season. First, Doncic tallied 27 points, 8 rebounds, 5 assists and 3 steals for a PIR of 41 against AX Armani Exchange Olimpia Milan. Then, he posted 28 points and 9 rebounds against Zalgiris Kaunas to give Madrid a 4-0 start despite a growing injury crisis. Those performances made him the winner of the MVP of the Month award for October, too. The brilliance continued as he registered 19 points, 6 rebounds and 6 assists against Maccabi FOX Tel Aviv in Round 6, posted a double-double against Unicaja Malaga in Round 8 with 13 points, 10 rebounds and 6 assists, and recorded a career-high 33 points at Olympiacos Piraeus in Round 11. Another MVP of the Round award followed in Round 15, as Madrid down reigning champ Fenerbahce Dogus Istanbul on the road and Doncic threatened a triple-double with 20 points, 8 rebounds and 10 assists. Between Rounds 19 and 22 Doncic averaged a PIR of 25.5, never dipping below 22. His fourth MVP of the Round honor came in Round 29 as he capped a 24-point, 9-rebound performance with a buzzer-beating triple to top Crvena Zvezda mts Belgrade. 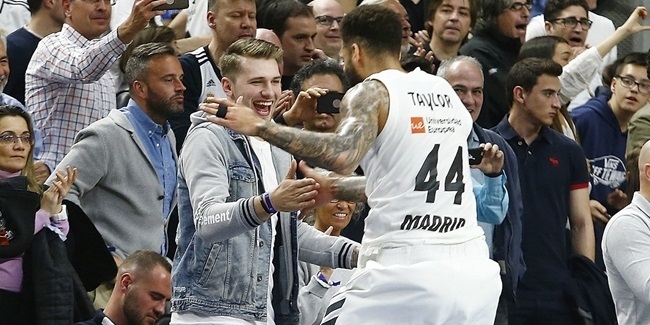 In the playoffs, Doncic helped defeat Panathinaikos with a PIR of 18 in Madrid's key, Game 2 road victory, a game-high 10 rebounds in Game 3, and a team-best 17 points as Los Blancos clinched won Game 4 to reach the Final Four. Doncic becomes the second Madrid player to be voted the Rising Star Trophy winner back-to-back, following in the footsteps of Nikola Mirotic in 2011 and 2012. Bogdan Bogdanovic also won two in a row for Partizan Belgrade in 2014 and Fenerbahce Istanbul in 2015. 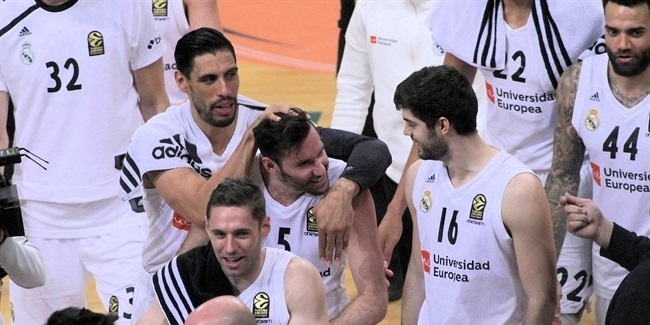 Madrid guard Rudy Fernandez is another former EuroLeague Rising Star, although he won the award with DKV Joventut Badalona in 2007. Erazem Lorbek was the inaugural Euroleague Rising Star in 2005 with Climamio Bologna. He was followed by Andrea Bargnani of Benetton Treviso in 2006; Fernandez in 2007; Danilo Gallinari of Armani Jeans Milano in 2008; Novica Velickovic of Partizan Belgrade in 2009; and Ricky Rubio of FC Barcelona in 2010. After Mirotic won the award twice, Kostas Papanikolaou took the 2013 award with Olympiacos Piraeus, before Bogdanovic won twice, then Alex Abrines of FC Barcelona Lassa took the honor in 2016.